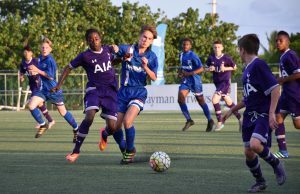 GEORGE TOWN, Grand Cayman – Tottenham Hotspur and Cavalier Soccer Club will face each other on Saturday to determine the champion of the Cayman Airways U-14 Invitational Youth Cup. Each advanced from the semi-finals after thrilling matches at the Ed Bush Stadium in West Bay against rivals from their home countries. In the first semi-final, Tottenham needed two overtime periods and a penalty kick shoot-out to squeeze their way past Gillingham FC. Spurs nearly found themselves trailing in the 8th minute when a Gillingham shot scraped the crossbar as it made its way over the Tottenham goal, eliciting “oohs and ahhs” from spectators. It was see-saw possession throughout the first half with neither side able to take the advantage. Stellar defensive play from both sides prevented anything finding the back of the net during regulation time. After two 10-minute overtime periods it was on to penalty kicks. Charles Noyelle and Jude Arthurs converted the first two attempts for Gillingham, as did Tarrelle Whittaker and Noni Madueke for Tottenham. Then Toby Bancroft stepped up to the spot for Gillingham, only to have Joshua Oluwayemi make the save. Jamie Bowden scored to give Tottenham a 3-1 advantage. The pressure was on Tom Halliday to keep Gillingham alive, which he did. Joe Walsh then saved a kick from D’Jean Spencer. With each side having one miss, Hayden Wood faced another must-score scenario but Oluwayemi denied him that joy. A score from Dennis Cirkin would seal the deal for Tottenham and when his kick beat Walsh, scenes of euphoria erupted as his teammates rushed to congratulate him and celebrate a hard-fought victory to advance to the final and await the winner of the all-Jamaica showdown in the second semi-final. Dwayne Attkinson lived up to his nickname “Busy” on the field for Cavalier SC. 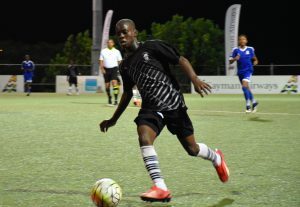 Cavalier Soccer Club and Harbour View FC, two of Jamaica’s most impressive youth programmes, then took the pitch with a berth in the final against Tottenham at stake. It took only six minutes for Cavalier SC to take the lead thanks to a header from Shanthamoi Brown, who netted his eighth goal of the tournament – the most by any player so far. The lead was doubled three minutes later due to a score by Cavalier captain Michael Allen. Despite the 2-0 advantage at the half, Cavalier SC continued to press for more but so too did their Kingston rivals. In the end with no goals in the second period, Cavalier SC held off Harbour View and locked up a showdown with Tottenham in the championship match. Micah O’Garro was lively in defence for Sunset. 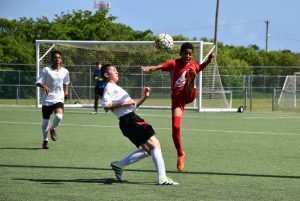 In an earlier consolation match, Sunset FC (Cayman) and IFFDC (Dallas) battled to a draw. IFFDC, played some of their best football of the week and put Sunset under early pressure but a critical save by Lucas Burke denied them the early lead. That changed in the 9th minute when Finn Millward fouled Tomas Pondeca in the box and IFFDC was awarded a penalty kick. Patrick Koffi made sure that it counted, giving the Dallas side their first lead in any of their four matches. Minutes later, Sunset’s Josh Cox found himself one-on-one with the keeper but drove his shot wide. After trailing 1-0 at the half, Sunset only needed five minutes into the second to equalise when David Pitcairn got ahead of the defence and IFFDC stand-in keeper Jeri Mitchell Bush was unable to deny him the goal. Luis Martinez netted the go-ahead goal for IFFDC in the 59th. Sunset was still in the game though and levelled in the 69th thanks to Kameron Bennett. Academy’s Jack Slater (blue) battles for possession against a REV player. 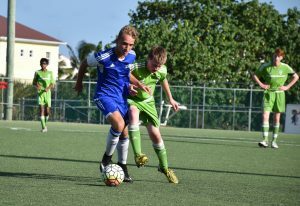 REV Soccer Club (Minnesota) beat Academy Sports Club (Cayman) 3-0 with scores from Mason Faint, Ben Lessert and Owen Johnson. Faint’s goal put his side ahead in the 9th minute but it was not until the second half that Lessert (51’) and Johnson (62’) put the game away. Tournament hosts, Academy fought hard throughout with solid play from captain Dominic Owens leading the way.